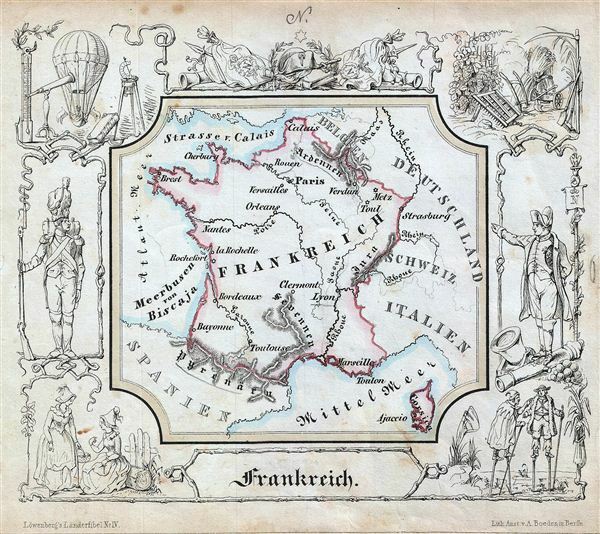 A delightfully whimsical 1846 map of France, from a German kinderatlas or children's atlas. The map details France and Corsica. The whole is surrounded by a wide border featuring charming vignettes meant to illustrate the peoples and cultures of the region. These include two men on stilts, two women chatting, a French soldier, a man in a balloon with scientific instruments, a portrait of Napoleon, etc. The map is accompanied by its adjacent page, which includes a poetic history of the kingdom of France in German gothic type. The wonderful and rare map was drawn by Anst. V A. Boeden of Berlin for inclusion as plate no. IV in the 1846 issue of Julius Loewenberg's Geographische Landerfibel. Julius Loewenberg (1800 - December 12, 1893) was a German Jewish printer, geographer, and author active in Berlin during the middle part of the 19th century. Loewenberg was born in the Duchy of Posen. He attended Yeshiva in Kleczewo (Poland) and graduated to the Protestant Gymnasium of Thorn before moving on to study Christian theology and geography at the Universtiy of Berlin. His works include various atlases, histories, and several translations of the works of Alexander von Humboldt, with whom he was apparently close. Loewenberg died in a Jewish retirement home in Berlin. Lowenberg, J., Geographische Landerfibel, (Berlin: Stern & C.) 1846. Very good. Even overall toning. Blank on verso.